Viewbook 2005: You Should Be Here. You Should Be Here was the theme for the 2005 Viewbook for The University of British Columbia. This publication is sent to high school students across Canada and in three sections introduces students (and their parents) to life at UBC; to the various faculties and career possibilities; and outlines the admission requirements and funding options. The yellow squares highlighted various reasons why “Here” was why prospective students should be considering UBC. In 2006 UBC initiated viewbooks specifically targetting students who might be considering transferring from another university, or from a community college. 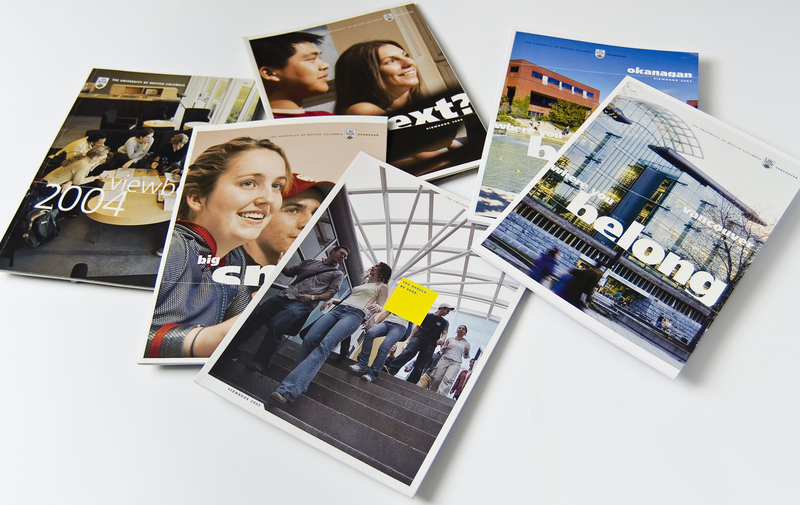 The design and layout were based on the domestic viewbooks produced both these years (for both the Vancouver and the new Okanagan campuses) which had a theme of “what’s next”. This theme was carried through with the typographic treatment of headlines which were not completely visible, and photos that bleed from one spread onto the next. The photographs were carefully chosen and cropped to make readers feel they are, or could be, part of the picture.